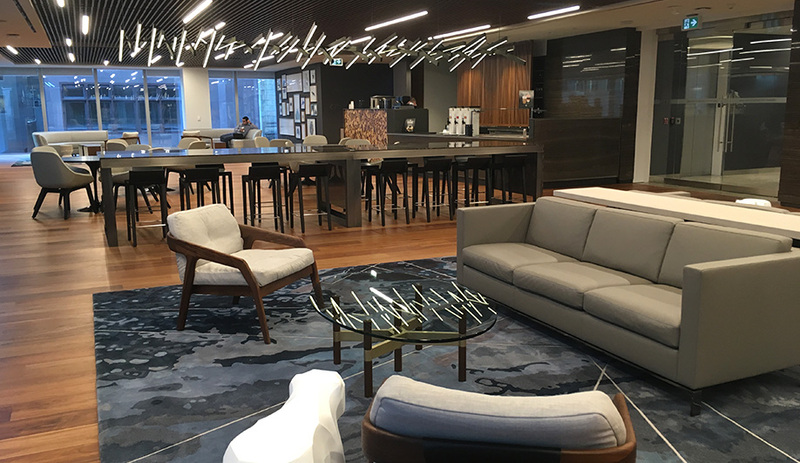 From woodsy lounge areas to treadmill desks, Deloitte’s new office in downtown Toronto has taken the concept of activity-based work to the extreme. Personal desks haven’t disappeared entirely, but working at one day-in and day-out is on a dramatic decline. Like other major companies, Deloitte has gone all-in with the work-anywhere revolution. 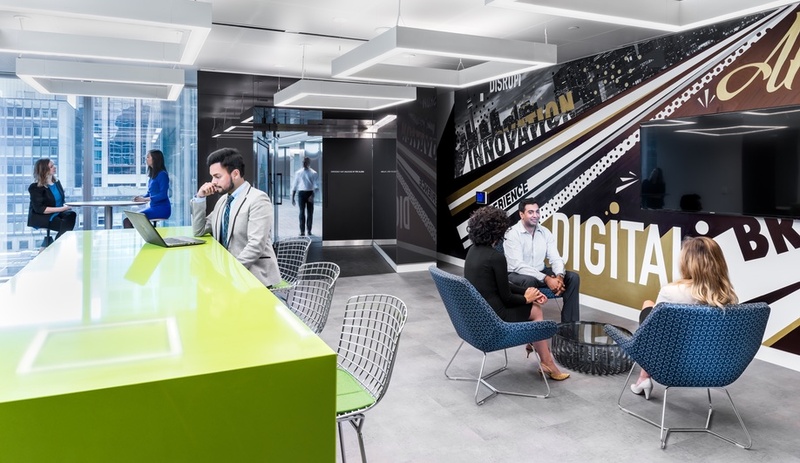 For years, the world’s largest accounting firm has been rethinking how offices of the future should look and function, and finding the best ways to keep employees happy and engaged. Deloitte’s new street-side café in Toronto. 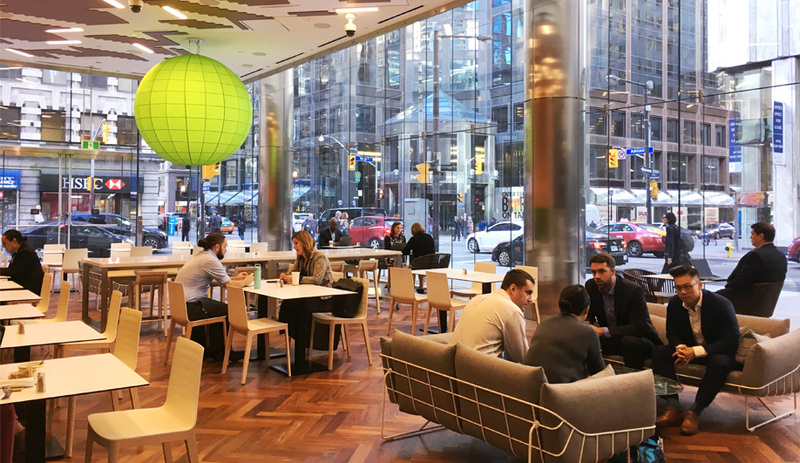 The first sign Deloitte is doing things differently is evident on the street, where the six-storey building’s most visible corner (at Yonge and Adelaide) is an airy and spacious café for Deloitte employees, with double-height ceilings and fresh-looking blonde wood covering the walls. While it does seem odd that such a publicly visible corner is reserved solely for Deloitte employees, it has brought life back to a section of Toronto’s downtown core that has been in a state of limbo for years. 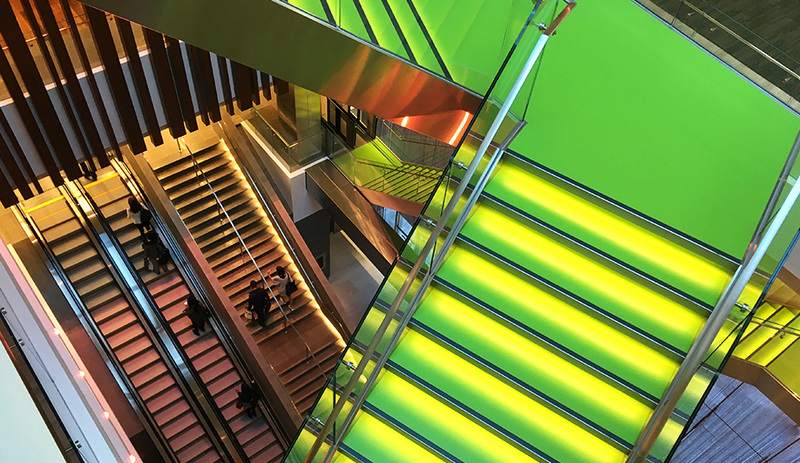 Green stairways illuminated with LED stripes zigzag through the new building’s central atrium. Around the corner, the main lobby leads visitors directly to a lime green, LED-illuminated staircase that zigzags across a central atrium like an Escher illusion. 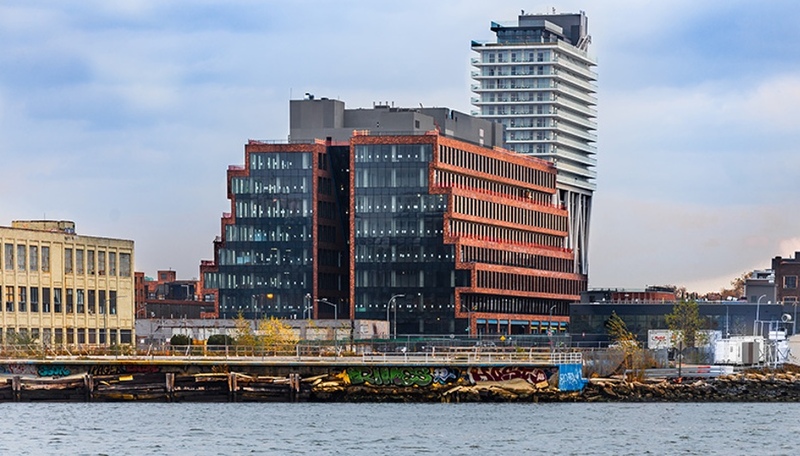 It’s one of the most impactful features of the building and a symbolic gesture of Deloitte’s interest in the health and wellbeing of its employees – a recognition that more people will climb stairs if escalators and elevators are harder to find. The lounge area of Deloitte University, an in-house conference centre for holding seminars and workshops. The stairwell connects multiple levels of office space and Deloitte University, a self-contained convention centre where international employees and clients convene and learn from each other through seminars and workshops. The university, designed by Arney Fender Katsalidis (with architects of record Kearn Mancini Architects), is a showpiece for the company, and a large portion of real estate is devoted to making visitors feel like they can, quite literally, check their baggage at the door. New arrivals have a place to store their luggage and there is an on-site, pre-flight check-in with an arrivals and departures board to track flight delays. Deloitte-as-concierge even goes as far as having rooms perpetually booked at the Royal York Hotel so travellers don’t have to spend time sorting out accommodations. A Canadiana theme prevails, but is played up the most in the university’s lounge area. 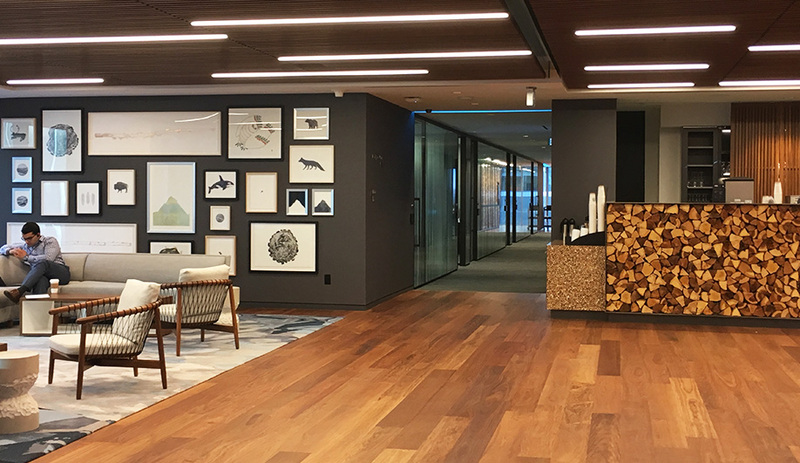 To further lose the corporate vibe, the expansive lounge area has been given a Canadiana theme, with wood plank flooring, a Lawren Harris-inspired painting by artist and writer Douglas Coupland, and an accent surface made from stacks of cut firewood. The overall effect is a cross between an airport VIP lounge and a chic and inviting urban ski lodge. Each floor has a colour-coded kitchen area that is more like a bistro. 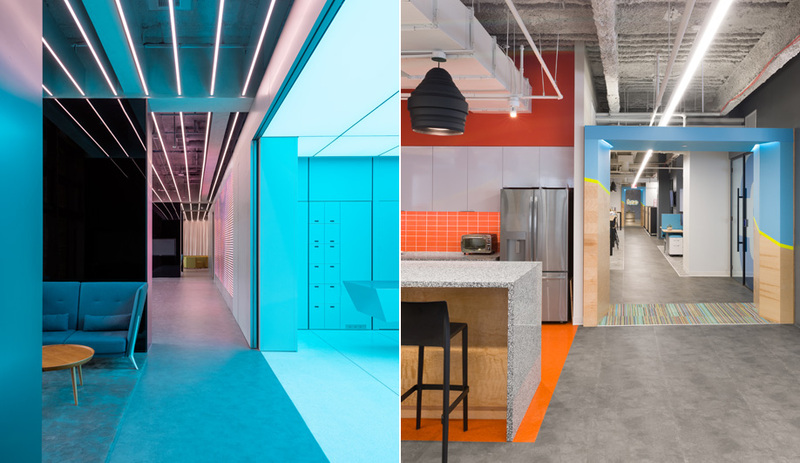 The remaining levels offer some 4,000 employees, who don’t have assigned workspaces, a bevy of working styles and locations to choose from on any given day. Many of the options have become the norm in forward-thinking offices, from hooded seats that face onto full-height windows (for a bit of downtime), to break-out areas furnished with Knoll womb chairs, and kitchen areas that are more like bistros. 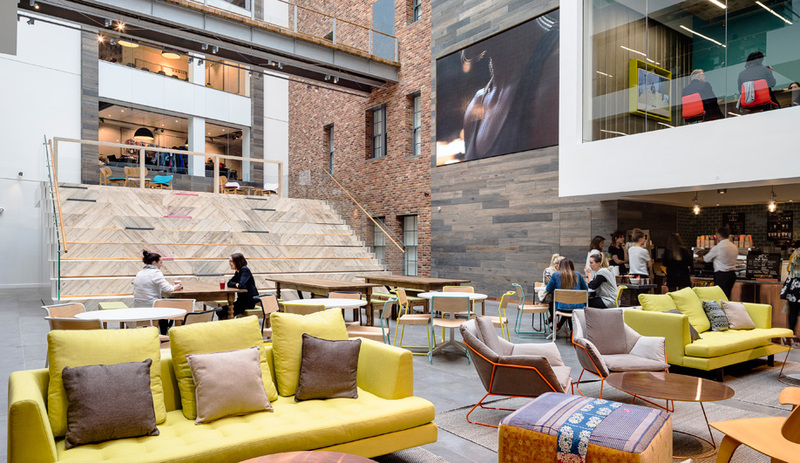 There are 18 variations for flexible working in all – including a rooftop patio – and most are located near windows, offering another health benefit to the overall design. The most work-looking seating is a series of desks that accommodate standing, sitting or treadmill walking. 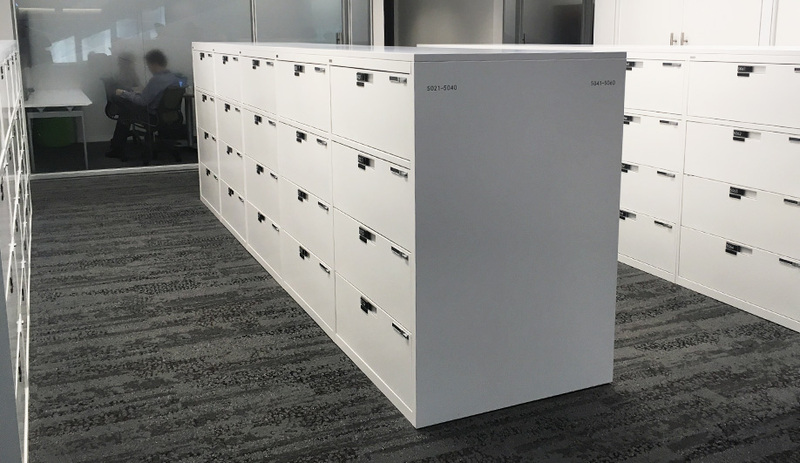 Personal belongings, like coats and backpacks, also have a new system: rather than closets, they are kept off chair backrests and stowed in lockable metal drawers similar to filing cabinets. To eliminate clutter, coats, bags and personal items are stored in lockable drawers. 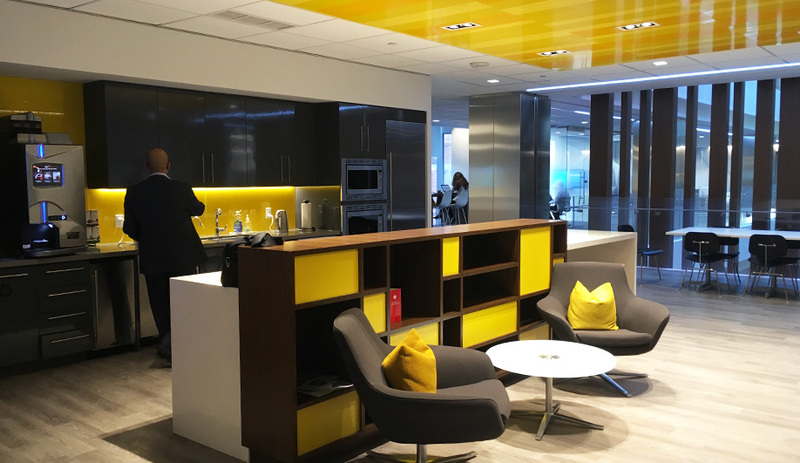 To finance the move, Deloitte consolidated seven offices from across greater Toronto, and by reducing its desking system needs, the firm’s in-house designers have managed to lower the square-footage needs as well. 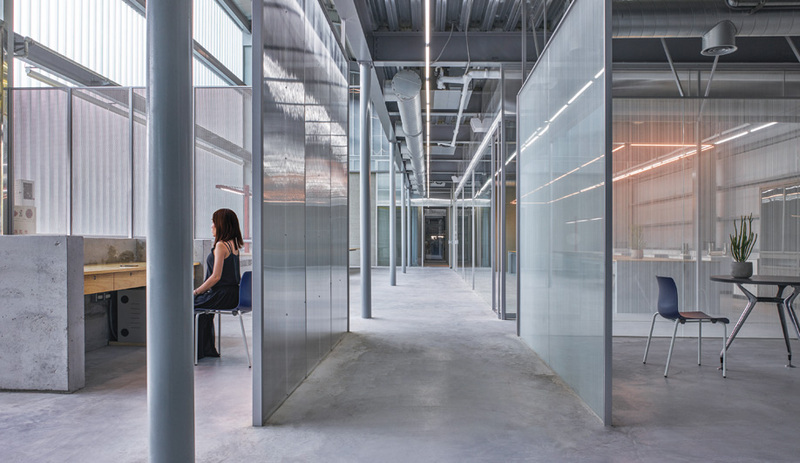 There are now more employees who require much less space. 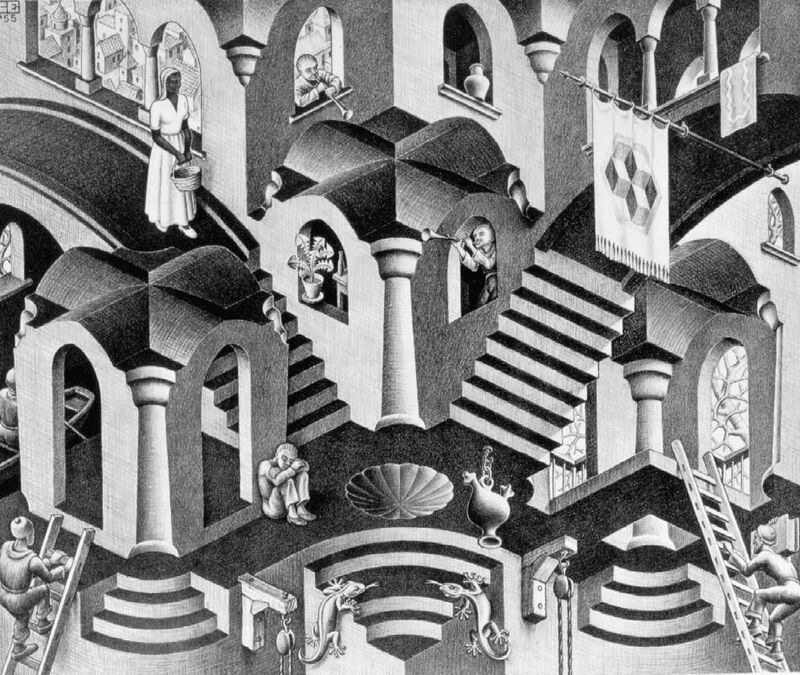 Yet, walking through the multi-level offices, the atmosphere is open, casual and relaxed.